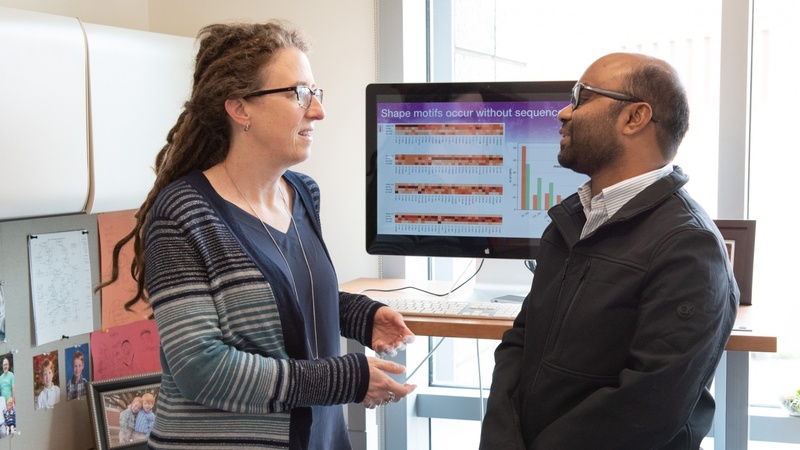 A new study by Katherine Pollard (left) and Hassan Samee (right) challenges a fundamental assumption of how proteins interact with the human genome. You can think of DNA as a string of letters—As, Cs, Ts, and Gs—that together spell out the information needed for the construction and function of cells. Each cell in your body shares the same DNA. So, for cells to take on their differing roles, they must be able to turn on and off specific genes with precise control. The genes active in a brain cell, for instance, are different than those active in a skin cell. Earlier work had raised the possibility that the DNA shape provides additional information to proteins on where to bind, but it was unclear how influential these shapes were. To test their theory, the researchers adapted a common machine learning algorithm typically used to identify the letter sequences proteins bind to, except now they were looking for patterns in shape. They discovered that over 80 percent of proteins bind to a specific shape pattern in the genome. Gladstone Senior Investigator Benoit Bruneau, PhD, also contributed to this study. The work was supported by the National Institutes of Health and William H. Younger, Jr.